I don’t travel much. As a matter of fact, all the flying I’ve done in my adult life has been because of blogging, and all my flights have been to much warmer climates than my own. Every time I’ve left my home turf, I’ve found the experience a little unreal. Unmoored from my usual routine, I’m bombarded by new food, new surroundings, and new people, and I start to feel like I’m in a waking dream. It’s bad enough leaving your hometown to join over six hundred people on a mad schedule of early risings and late retirings, sandwiching visits to several gardens, thought provoking lectures, and conversations with like-minded strangers in between. But the plants . . . what did they do to the plants? They grow them big down there. 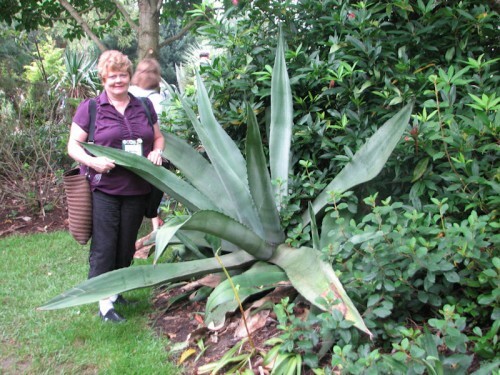 Mary Ann Newcomer, a normal-sized person who blogs at idahogardener.com, graciously agreed to stand by this agave(?) at Plant Delights Nursery to provide a sense of scale. This castor bean plant at Montrose Gardens dwarfs the woman walking past, and is giving the two-story building a run for its money. 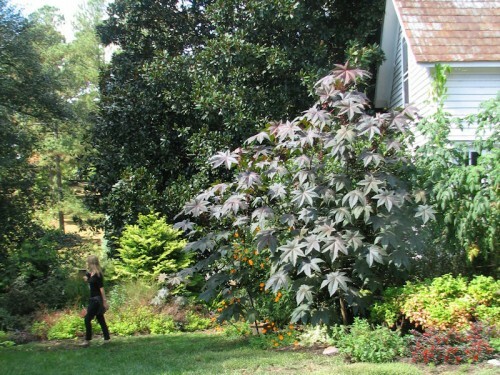 The heights that southern plants can attain in one season does give this cold climate gardener an Alice-in-Wonderland or Dorothy-in-Oz kind of feeling. It also occasionally gives her fits of envy. Or maybe she is just starting to understand the handicap a cold climate imposes. Let’s start with rosemary. I’ve been very happy to keep my rosemary alive indoors in a container for several winters. It’s finally starting to attain some size. But size is relative. This rosemary was growing in Denny Werner's North Carolina garden. It even had a few blooms on it. My totebag is there to provide scale. Same totebag, different rosemary. My rosemary. Okay, it's been near death a couple of times, but it's pulled through, and never has it looked so lush. Or so puny. I can’t tell you how many times I inquired about an intriguing plant only to discover it was a salvia hardy only to warmer climes. (We call them tender salvias up North.) But I had once attempted to grow Salvia guaranitica ‘Black and Blue’ as an annual, so I had some basis for comparison. Salvia guaranitica as grown in Juniper Level Botanic Garden, a project of Plant Delights Nursery. 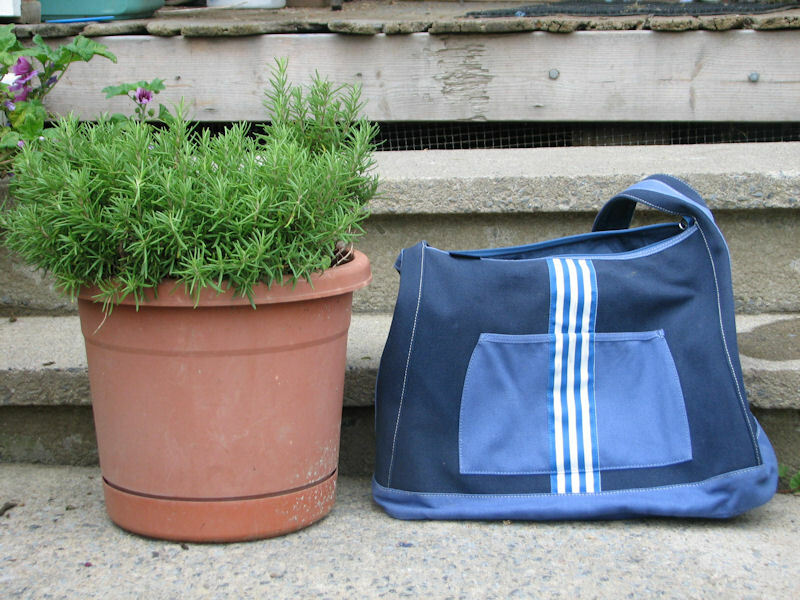 I hadn't thought to use my totebag to provide scale at this point. Let's just say shrub-like proportions and leave it at that. 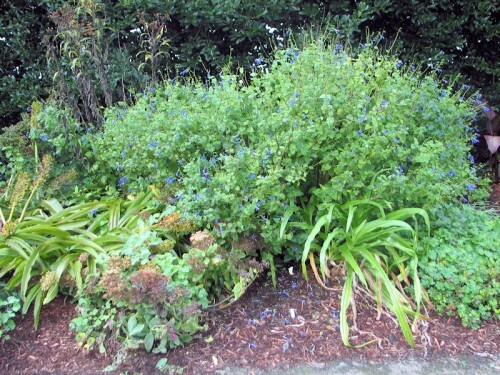 I attempted to grow 'Black and Blue' salvia in 2005. This is what it looked like in August. I circled a blossom so you could find it more easily. I just might try this vivid blue salvia again, but maybe I’ll keep it in a pot like I do the rosemary and bring it in for the winter. This basil thrives in Denny Werner's garden, though it obviously hasn't been harvested in a while. Want to see my basil? You can’t. By the time I got home, it was already flattened by frost. History. Black and dead. They don’t call us hardy souls for nothing. I think other big things grow in Southern gardens, but I’m not sure what they all are. As seen in the garden of John Dilley and Willie Pilkington, right down the road from Plant Delights Nursery. The South: am I dreaming, or is this real? Loved this post 🙂 I was just in the South, too. 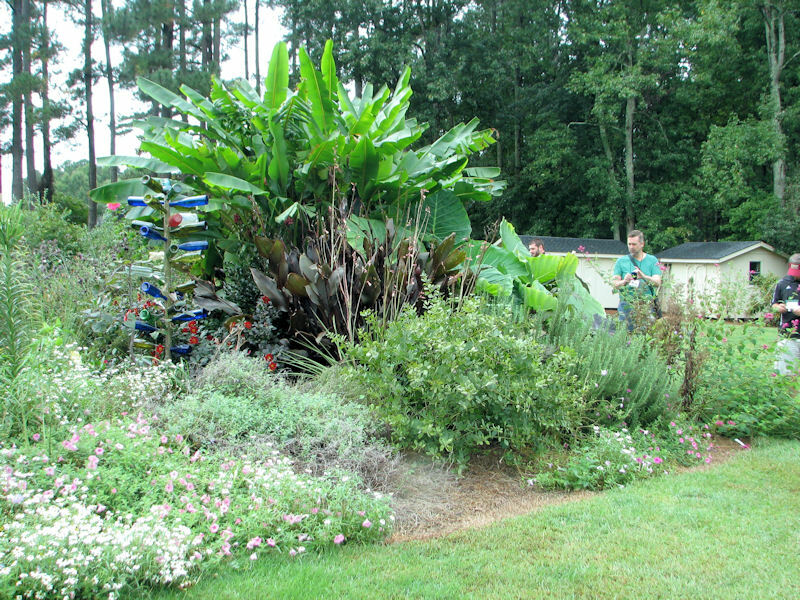 Wish I had seen more of the personal gardens of the area, but that is one highlight of the garden related conference that you attended… looks like you saw some of the best. We gardeners have our own cultural cliches: “the grass is always greener…” or in the case of the pictures of your post: “always bigger”??? 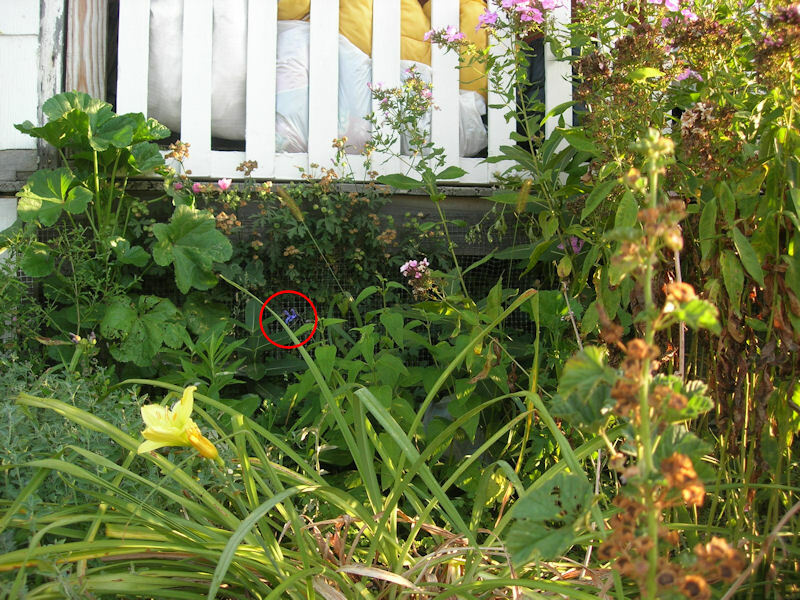 .-= Ilona´s last blog ..Garden: Fail =-. This was hilarious–thank you for the morning laughs! .-= Daffodil Planter´s last blog ..Capitol Bees =-. Considering how well you do humor yourself, that is high praise indeed. I battle weeds and fire ants year round down here on my corner of Katy … your cold climate does give you some advantages in those areas! Not only are blooms bigger in colder climates, but the colors are much richer and more intense. North Carolina had a lot of familiar plants but they also had a lot that were new to me. It always amazes me to visit a different cold/heat hardiness zone and see the similarities/differences. I was amazed at the size of the rosemary, too. I could smell it on my fingers for hours afterwards and wished I could grow it in my garden. This year I may try a potted one, Kathy. Several years ago I made my only trip to Los Angeles and visited a friend there. The size of Jade plants used as shrubs in the landscape blew my mind. And to see real lemons the size of grapefruit on a tree in her backyard was mind-boggling – I’d only ever seen them in the supermarket and they were tiny! But the really astounding landscape is in Alaska. There are amazing gardens in Alaska and the most intrepid gardeners you’ll ever meet. Because there are nearly 24 hours of daylight in their very short spring and summer, the vegetables and flowers grow enormous. Queen Anne’s lace on the roadside, was as big as a dinner plate. They have a State Fair, and the pumpkin competition is like nothing we see here in New York! Barbara, check out my various blog posts on rosemary before you buy. Some cultivars are more amenable to indoor culture than others. Having grown up in Ithaca, NY, I’ve marveled at the enormous difference in seasons you see just 150 miles farther south. Sadly, I live on a demarcation zone between where rosemary survives the winter and where it dies in the cold. As you’ve observed: when it survives, it can grow quite large within a few years. .-= cityslipper (social marketing strategies)´s last blog ..Your Company Name on Social Networks =-. Hilarious. This year in my zone 6 gardens plants recieved soooooo much water that they are taller than normal also–but nothing like the castor beans. They made me feel like I was in Jack and the Beanstalk. 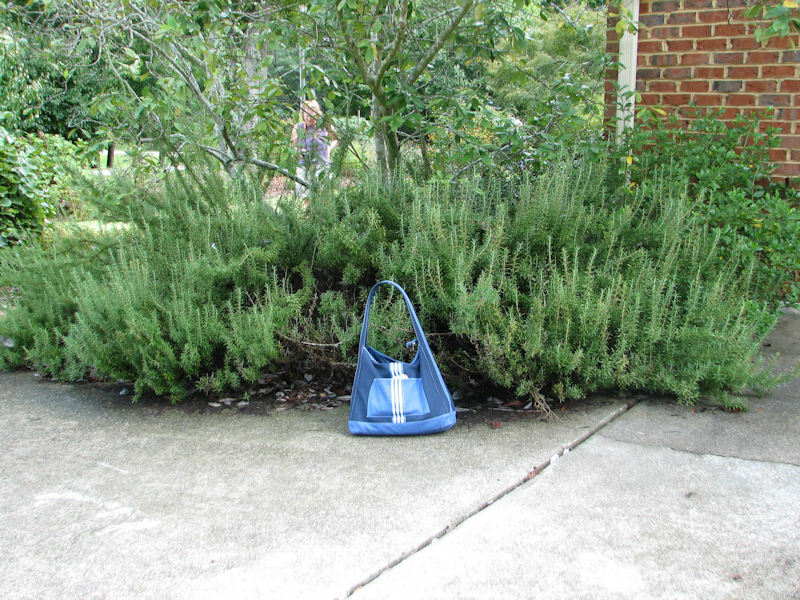 I do wish I could have a rosemary hedge like the one that I saw in Chapel Hill the day I left though. Delightful! Delightful! I especially love the photo comparisons with your purse as the meter. But in some cases your northern climes favor growth. I’m always amazed at the size of flowers, especially roses, in England where the long summer days and corresponding moderate temperatures produce flowers bigger than my fist that last for days or even a week. In Austin’s heat, the same varieties produce comparatively wizened blossoms which open and then fade by noon on the same day. Traveling and seeing in person what we have only read about is a wonderful exploration. I’m glad you have found the resources to be able to do it…and that blogging provided a bit of the motivation. .-= mss @ Zanthan Gardens´s last blog ..On Returning Home =-. True. We can’t really grow delphinium as anything other than an annual here, and I miss growing 7 ft. tall specimens. .-= Katie´s last blog ..But it’s so HARD to be quiet! =-. Oh yes, and the south is a STRANGE place. .-= Katie´s last blog ..Free Speech =-. Hey Kathy-I LOVE your post and the commentary. That’s so funny! It is neat to see the gardens through the eyes of somebody from a totally different region. I have enjoyed your summary and Doug’s from GWA, as the two most creative, I think! BTW-Salvia black and blue HATES it in my southern North Carolina yard, so I sympathize. I too was zoned out in NC. It’s easier to be somewhere like Florida where ALL the plants are different, for the most part. In NC they can grow what we grow – and as you point out, most of what we both grow does better down there – AND they can grow so much more as well. Fantasy land. 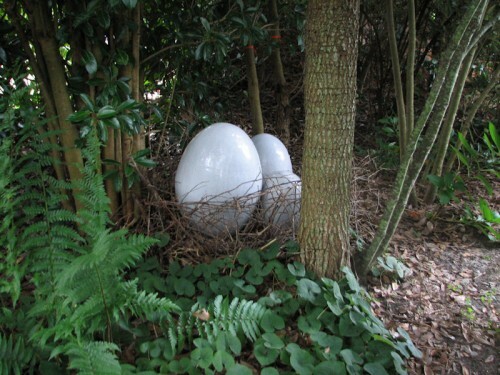 Somehow I missed those biggs eggs at Wllie-Dillie garden. Thanks for the Northern perspective! .-= Kathy J, Washington Gardener Mag´s last blog ..My Top 10 Things I was Grateful for at the GWA Symposium List =-. Kathy, judging from the photos I’ve seen, there were things there that I missed. Not surprising given the twisting nature of the paths. Kathy, I can relate! 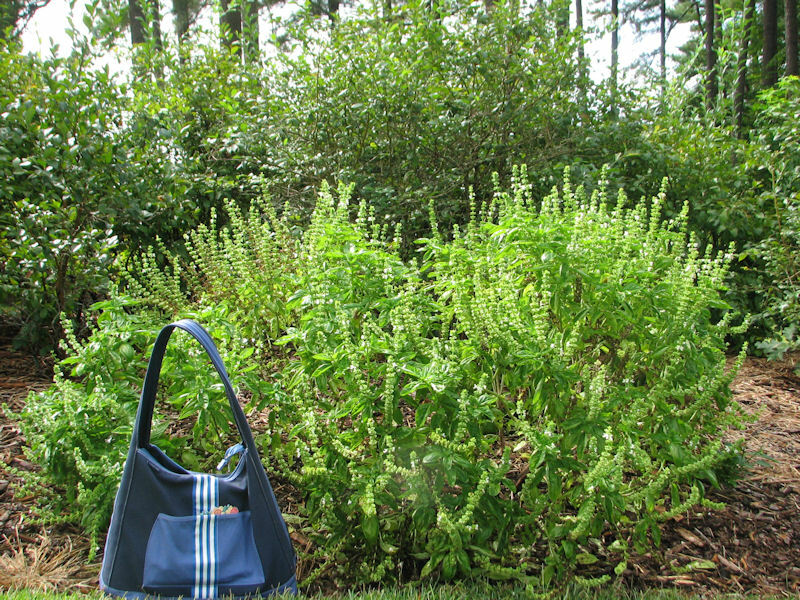 I wrote a post on my blog about my recent vacation to North Carolina, where I had to assume all the plants were on steroids. Hydrangea blooms bigger than my head, with the plant the size of a small tree. Oh my! It is fun to see, and rather intimidating, isn’t it? enjoyed reading your comments about southern plants – as a north carolina gardener, i had to chuckle a few times! i never thought about the fact that plants would grow larger here – score one for the south, i guess. the times i’ve been north i’ve been envious of the lushness. you have to water like crazy here to even keep things alive. not to mention the many annoying pests which attack the plants and the humans trying to tend them. .-= Gail´s last blog ..Little Asters Everywhere* =-. I was impressed by how tall their pepper plants were in the vegetable gardens we saw. Some were close to six feet tall, whereas in my zone 5 garden, a three foot tall pepper plant makes me think my thumb is green. .-= Carol, May Dreams Gardens´s last blog ..The Theory of Hortonnection =-. If you survived a close encounter with a fire ant’s nest unscathed, you are lucky indeed, Kathy. Ah, yes, plants do grow large here. 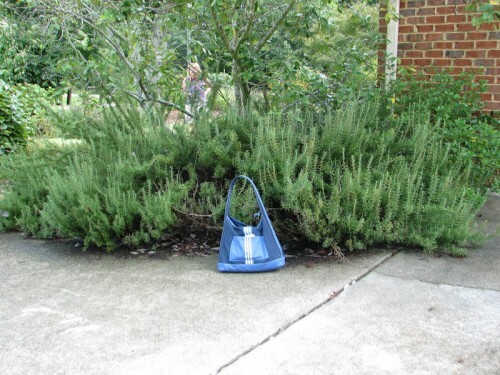 Your handbag comparison with the rosemary cracked me up. I bet you did feel like Alice who’d partaken of the bottle labeled “DRINK ME”—shrinking to tiny proportions. .-= Pam/Digging´s last blog ..Flowery Fall Friday =-. Don’t be too envious. Our long growing season does allow some plants to reach great proportions, but all sorts of insects thrive because of it too. Also, the heat and humidity that goes with our summers send a number of plants to the compost pile early. .-= Les´s last blog ..Hermitage Foundation Plant Sale =-. I’m not real envious. Just sort of envious. I did get to sample some of the heat and humidity, which is just like our heat and humidity, except you have more of it. I think I’d most like to visit during your spring, which is still our winter, and then go back home and have spring twice. My word, those are colossal plants! MA looks like a garden fairy next to that humongous Agave. But remember, they have fire ants. And Kudzu. .-= Mr. McGregor’s Daughter´s last blog ..Do You Dare to Bare? =-. I did see some kudzu. It’s sort of like vining Japanese bamboo. And when I got off a bus, someone said I stepped in a fire ant nest, but nothing happened. Must have been beginner’s luck.